My name is Jean Wells and I have been quilting forever... and I LOVE SOLIDS!!! Working with solid color fabric is such a treat for me. I love the challenge of creating a composition that speaks to the inspiration that I have chosen. I learned early on that no color is always warm or cool, dull or bright, light or dark----everything is relevant. It depends on what color it is placed next to. So I take on an attitude of auditioning colors to see who might get to be in the quilt. This attitude has served me well and I think my pieces are better for it. Since I like to work fairly abstract, cutting my lines without rulers, my quilts have a more organic feeling. In Stone III, a quilt from my new book due out in July (Journey to Inspired Art Quilting from C&T Publishing) you can see how I have used the softer yellows and greens with a touch of aqua in the piecing. But without the charcoal the pieced sections would be lost. Look closely at the individual colors and who places them and you will see examples of a variety of relationships. The color inspiration for this quilt came from Rabbit brush that blooms in late August. Most of my inspiration comes from nature as you can see from the two landscape style pieces in the book. One was inspired by the ocean and the other the mountains. Living in Central Oregon it is hard not to be inspired by rocks, trees, wildflowers, or a beautiful sunset. My go to color is 1192 Lime in the Kona Solid Collection. Sometimes all I need is a sliver to pull the eye through a quilt and other times I base the composition on lime. Landscape I from my book "Intuitive Color and Design" from C&T is a great example of focusing on a color family. Two other colors that serve me well when I am working are 349 Butterscotch and 1183 Jade Green. The butterscotch is a great warm color that goes with everything and the Jade is just enough of a blue and green combination that it can work in a warm or cool palette. It is funny how you find colors that speak to you and end up "saving the day" when you are working. Kona has 28 fabulous new colors for all of us to experiment with. I am liking Lipstick (Kona color 1194) which is a bright red. This spring as I was working on a landscape piece in earthy colors it was feeling like it needed something so I used slivers of red much like a brush stroke and it was wonderful. It may become my new "go to" color. I want to give away a copy of the fabulous new book We Love Color. To be entered into the drawing please post a comment with your favorite "go to" Kona solid. And best of all the winner will also receive a bundle of fabric. On July 6 I will give the winning names to Kauffman and they will send you your gifts. We received this wonderful email about a young girl making her first skirt...and she even made it for her little sister. How sweet. We wanted to post the message so everyone could see that this is a great pattern, even for beginners.Thank you, Brooke, for sharing your story with us. (I) picked up your (Tweet Tweet Skirt) card directions at Hollyhock Quilt shop in Harrisville, MI, on a whim. My 10 year old daughter has been wanting to make herself a skirt and your directions seemed to be the perfect fit. She ended up making one for her 19 month old sister first. I suspect that way if she “messed it up” she’d not have to wear it... The directions were easy to follow and use our measurements with. I love that it’s based on measurements and not the typical cut out the pattern, pin it and cut the fabric, etc. It allowed me to teach her about selvages, bias (stretch), measurements, ironing, pinning, etc. All the largeness of the project on the little card seemed to remove some of the perceived largeness of the project for her, and make it more manageable. Thank you again for making a wonderful day with Katie possible! the fabric fit my pillow form. my daughter Valori Wells designed for Free Spirit. them with others from the line. If you have not worked with the cotton/linen blends you are in for a treat. and accessories and they do not wrinkle like normal linens. ﻿﻿Happy Friday!!! Another beautiful day in Sisters....I think Summer is finally here! Summer makes my weekends perfect....not stuck in the house when it is raining and cold. UUUGGGHHH!!! Summer keeps us outside...in the garden, on the deck just enjoying our lives! And now for the down loadable version.....there are two different pages. It is designed so that you can print one page out flip it over and print out the other page, trim if needed and fold in half for a card! Fun to give away with some fabric and a pillow form as a gift. Now an update on the Summer Night Shawl with the knitted lace edge.....I had a lot of sitting around time last weekend when we worked the Rodeo Dance.....and I am excited to say the scarf is done! Made with Cocoon Voile...yummy! I am testing my knitting instructions on another shawl and then I will share the knitted lace edge pattern. My only added touch will be to topstitch in around the edges about 3/4" in from the seam. A BIG congratulations to Shelley R. of Woodland, Washington! 2012 Quilt Shop Grand Giveaway! The Stitchin' Post in Sisters, Oregon! Jean just returned home from teaching in Lopez Island over the weekend. Click here for a peek at the workshop and some thoughts from Karen Alexander (Quilt Historian) and workshop attendee! Here is our collection of Kaffe Fassett, Brandon Mably, Phillip Jacobs & Martha Nagley. Val's linen, voile and a few specialy fabrics for summer fashion & home decor. Bright & Bold prints by Alexander Henry and Echino. Fun display featuring Malka Dubrawski's Fresh Quilting book with a funky, hand-painted chair! Here's a bright combination of Micheal Miller and Malka Dubrawski fabrics. The back drop for this corner is from Val's booth at Quilt Market in Kansas City! Val's newest fabric line~ Wrenly's Christmas! Makin' a summer statement in nautical blues! Last summer I was approached by Ann Richardson of the Sisters Outdoor Quilt Show to help in creating and implementing the Quilt for Two Rivers, now renamed Two Rivers Three Sisters. Nationally, a few art quilt groups have created a project like this in the past and when I reviewed the work I was really excited to take on the task. I designed the layout of the river, created a few ground rules, cut blank paper the size of each quilt, marking only where the river was to enter and exit the artist’s quilt. We then invited 20 art quilters to participate in the project. It was up to the individual quilter to design and create her own collaborative piece of art. The quilting group was invited to a day of hiking and education with representatives The quilting group was invited to a day of hiking and education with representatives from the National Forest Foundation (NFF), U.S. Forest Service (USFS), and Deschutes Land Trust (DLT) which intrigued me since I have lived in Central Oregon for 28 years and really enjoy the outdoors. That day was quite an eye opener! Whychus Creek runs through Sisters, Oregon on the way to the Deschutes River and until recently, it ran dry in places by summer. This would happen due to water for irrigation rights being drawn from Whychus Creek through the upper end of Central Oregon. 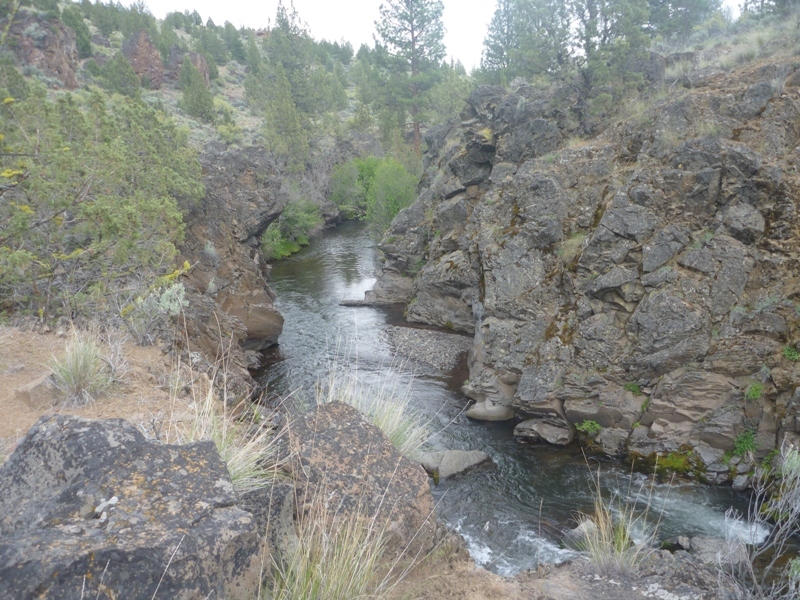 I was so impressed when I found out about the efforts of the NFF, USFS, Upper Deschutes Watershed Council, Deschutes River Conservancy and DLT to restore this river, bringing the fish and vegetation back! 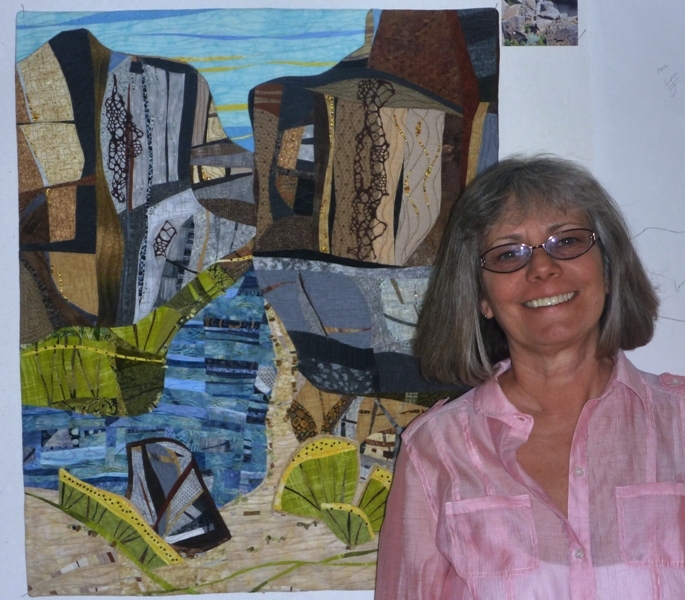 I created the last quilt in the series because my vision was to have the river wind into a canyon as there are so many beautiful rock cliffs in the area. Taking pictures, and drawing from memories of my hiking experiences, I created an abstract quilt that completes the river mural. The techniques used were curved piecing with machine appliqué and beadwork added for a final touch. My hope is that not only the artists will have enjoyed their donation to river restoration but that viewers of the Two Rivers Three Sisters quilt will learn from, and respect the efforts of, the many people involved.